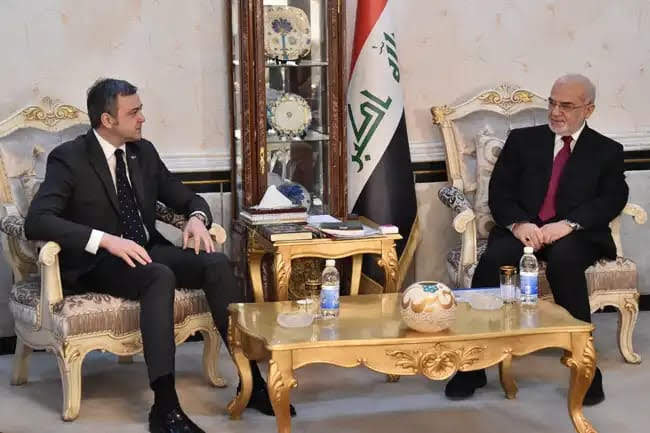 Foreign Minister Dr Ibrahim Al-Jaafari received a copy of the credentials of the new ambassador of Serbia to Baghdad, Mr. Uros Balov, and discussed the bilateral relations between the two countries and means of upgrading them to meet the aspirations of the two friendly peoples. He praised the support given by Belgrade to Baghdad in its war against Da'esh terrorist gangs, considering the victory over the terrorism that has been achieved in Iraqi as a result of the concerted political and military efforts and international support provided by friendly and peace-loving countries. During the meeting, he called on Serbian companies to invest in Iraq, especially infrastructure reconstruction projects, and expressed the readiness of the Foreign Ministry to provide all services to the diplomatic mission to develop joint work between the two countries. From his side, Mr. Uros Balov expressed the gratitude of the Serbian government to the Republic of Iraq for support on the unity and territorial integrity of the Republic of Serbia and stressed on his government's aspiration to develop relations with Iraq in all fields. He invited Dr Ibrahim Al-Jaafari to visit Belgrade in the framework of strengthening relations between the two countries.